Baska Voda is among the most beautiful tourist destinations in Croatia. Situated at the foot of the magnificent Mountain Biokovo, Baska Voda offers not only untouched natural wonders, amazing beaches, crystal clear and pure sea; but also the first rate touristic services as one of the most developed modern tourist resorts in Dalmatia. Being situated at the sea shore, but also at the foot of the mountain, Baska Voda is blessed with the mild Mediterranean climate and fresh and healthy mix of the mountain and marine air. The air temperature is ideal for the early beginning of the tourist season; July is the warmest month with the average temperature of 24,3°C. The sea gets warm enough for pleasant bathing as early as May and often stays that way until October. Winters are mild in Baska Voda, and while snow is a rare occurrence by the sea, it can be often seen on the tops of the Biokovo. It is peculiar to bathe in the already pleasantly warm sea in May and look at the mountain tops still covered with snow. Baska Voda is easy to reach once you come to Split. After your arrival by train, boat or plane, you can catch a bus towards Baska Voda. Regular bus lines drive to and from Split all year long. It is a rather short ride since Split is only 51 km away. The accommodation service in Baska Voda is among the best in Dalmatia. There are several hotels, the majority of them four star prized. The most popular tourist resorts are Berulia, Horizont and Conte hotels, with the variety of accompanying services and activities, swimming pools, private beaches and spa centres. Private accommodation follows the diversity and quality of Baska Voda hotels. There are numerous possibilities ranging from simple private rooms to luxurious apartment houses. The prices range between 20 and 200 euros depending on the venue and the part of the season. For more adventurous tourists, Baska Voda offers accommodation in auto-camp Basko Polje. Besides breathtaking beauty of nature; the untouched, pebbly beaches and the glorious mountain slopes; Baska Voda has a lot more to offer. There is a variety of summer sports in the regular tourist offer. You can enjoy free climbing, board sailing, water skiing, the school of diving and so much more. There are several sports terrains for tennis, football, basketball etc. Parts of Biokovo above Baska Voda have been protected as a natural reserve for the past three decades. We warmly recommend you visit this natural park and the adjacent botanical garden of the immense beauty, rich vegetation and wildlife. Enjoy the fresh mountain air and admire the magnificent view from one of the Biokovo tops. Although Biokovo is a place of unearthly beauty, it can also be dangerous. It is therefore important to strictly follow marked and secured paths during your visit. Baska Voda has a rich historical and cultural heritage; its history goes back to prehistoric and ancient times all the way to the baroque period and the modern age. There are numerous remains indicating the existence of life in this area as early as 4000 years before Christ. It is interesting to visit some of the archaeological findings of the antique buildings and forts as well as beautifully preserved baroque churches in the area. During your stay you should definitely taste some of the local specialties: Biokovo Peka (mixed meat and potatoes baked under a special iron lid called peka), boiled frog-fish, fist stew made of grooper or rafioli (Dalmatian pastry with almond and maraschino stuffing). The highest rated local restaurants are King, Bracera and Bratus Tavern. Baska voda mostly offers a low key nightlife with numerous beach cocktail bars, dancing terraces, concerts and other events. 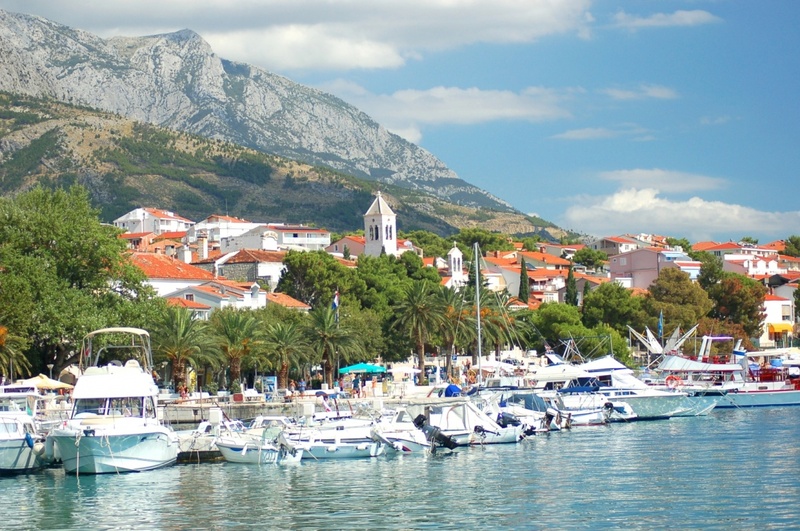 For a more lively night out and a more diverse offer, visit nearby Makarska. Find information about selected Hotels, apartments and rooms in Baska Voda to choose the perfect place for your accommodation.